Forget Brexit and Italian populists for a second. It’s worth paying attention to what’s going on in France. For more than two weeks, the country has been disrupted by an unusual protest: the so-called “Gilets Jaunes” or “Yellow Vests.” France is used to labor unrest and chaos affecting transport of course, with strikes something of a national pastime. Some 100,000 people blocking toll roads, petrol stations and crossroads is creating major disruption to transport and retail. It’s also proving to be extremely tricky to defuse, as there’s no single protest leader to negotiate with. For investors, the question is whether it could derail the outperformance of French equities in 2018. One thing is clear. These protests are a real threat to the country’s retailers, including Carrefour and Casino, which are already busy battling a price war and trying to fend off Amazon.com's efforts to penetrate their home market. Big-box retailers have been hurt by the demos and blockages throughout the country, with customers denied access to some hypermarkets and supermarkets for entire days at a time. They recorded an average fall in consumer-good sales of 35 percent on Nov. 17 and of 18 percent the following Saturday, according to Nielsen data. All this is adding to the perception of shrinking purchasing power in France, in particular among people on lower incomes. And that “doesn’t bode well” for the year-end holiday retail season, which needs a boost after the unseasonably hot weather of the previous months, according to Invest Securities. In fact, consumer confidence has been depressed since the summer, and this might be the final straw. The impact on toll roads is harder to quantify, as demonstrators have been regularly opening them to let cars pass freely. Vinci is the largest operator in France and although motorway concessions only account for about 13% of its 2017 revenue, they generated more than 59 percent of its Ebitda. So brace yourself for an impact on earnings if the unrest gains traction. The protests started on Nov. 10 with thousands of demonstrators demanding lower gasoline prices and taxes. Demonstrators marched on Paris’s Avenue des Champs-Elysees two weeks later, triggering social unrest. 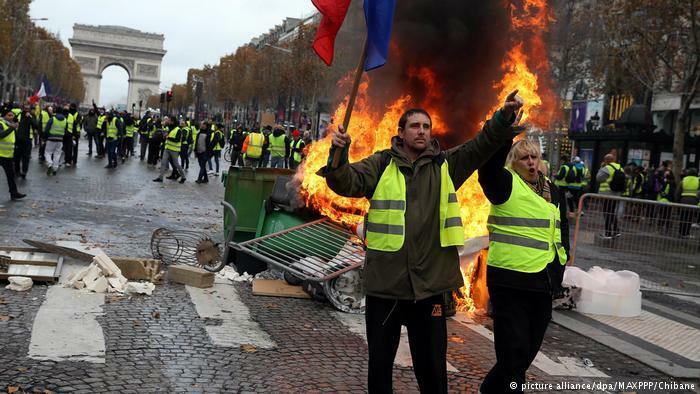 Surprisingly, the protest is benefiting from a significant backing, with 84 percent of the French public calling it “justified,” according to Odoxa-Dentsu poll for Le Figaro. Further rioting over the weekend shows the movement is spinning out of control. If this movement snowballs like we’ve seen in Italy with the Five Star Movement, Macron will have his hands full handling a crisis at home and have less time for the matters of the euro zone. After Greece, Brexit and Italy, this is another front that Europe didn’t need. This is something to keep in mind, although today, the market will be focused on positive developments coming out from the G-20 meeting, with markets rallying globally.